I remember watching Becca from the very beginning of her design career and loved her designs from the beginning. It was so fun to hear her talk about her start in digital scrapbooking and designing in her episode of the Digest. Becca’s enthusiasm for design and digital scrapbooking is contagious and it was a joy to visit with her! Find Tickled Pink Studio’s full feature here. download here, or subscribe in iTunes. Layout by SharonS. Supplies: Take Note by Tickled Pink Studio; Template: KH Designs; Font: KG Somebody That I Used to Know. Layout by Vicki. 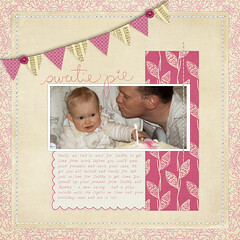 Supplies: Take Note by Tickled Pink Studio; Shortcuts by Scrapbook Lady; Fonts: Bariol. Layout by Heddy. Supplies: Take Note by Tickled Pink Studio. Layout by Trina. 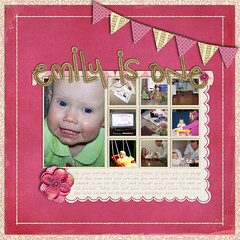 Supplies: Take Note by Tickled Pink Studio; A Special Collection (templates) by Janet Phillips. Layout by Rachael. Supplies: Take Note by Tickled Pink Studio; Fonts: Pea Sadie & GF Halda Normal. When I first attempted organizing my digital supplies, I very enthusiastically jumped into it. Using the file manager software ACDSee, I took every kit and keyword tagged every individual item within each kit. I even had the papers sub-categorized by colour! Just imagine hundreds of kits tagged like this! It didn’t take me long to realize that level of organization was just not sustainable. It especially didn’t make sense for me since I am mostly a one-kit scrapper and I don’t mix and match on scrapbook pages very often. I still use ACDSee for organization, but now I just tag kit previews with the designer name and the fact that it’s a kit. And sometimes, if it’s a themed kit, I’ll tag the theme (e.g. Birthday, Christmas, Winter, etc.). In the past few years, I have transitioned to doing a lot of pocket scrapbooking. In this style of scrapbooking, I do enjoy mixing products. Usually I’ll use one main kit, but then add in element packs of stitches, doodles, tags, dates, stamps, and journal card templates. Until recently, I had tagged the journal card packs that I purchased, but I felt like I was missing out on making use of the awesome cards that are included in many kits. I chose to tag both the previews (when available for the card packs) and the individual cards. I quickly went through the kits I purchased in the past year (which I found by selecting my tagged kits and then sorting them by date) and checking each one for cards that may have been included in the element pack. It was pretty easy to do, especially when I focused my efforts on the designers who often include journal cards versus the ones who rarely do. I tried not to get too fussy with the tagging. So if a card was an equally good fit in “Everyday” and “Valentines / Love”, then I put it into both categories. One unexpected benefit of having my cards tagged is that now I have a huge library of cards to browse through and use as inspiration for when I make my own cards to go with kits. I actually like having my pocket cards organized so much that I’m going to add another category for Other Pocket Products. This will include things like pocket templates, stitched or doodled frames sized for pockets, and word art and tags that lend themselves particularly well to pocket scrapbooking. I think that will help me make better use of some of the awesome pocket supplies that I’ve picked up over the years. How do you organize your digi pocket cards and supplies? Layout by Vicki. Supplies: Eternally by Ange Designs; Fonts: CK Ali, Jailbird Jenna, Calibri. Layout by Vicki. Supplies: Eternally by Ange Designs. Layout by Jacki. Supplies: Eternally by Ange Designs; Gotta Scrap Now 2-1 (template) by Janet Phillips. Hello there ! I’m Ange, french designer since 2008. I’m the mother of 4 lovely girls so my univers is very girly and this is a good thing because i’m in love with pink colour ! I can create romantic and magic atmospheres with sweet and soft colours as well as festive and funny kits with brightly colours. But always in a clean and simple style, that’s my fave. An image on pinterest with pictures hooked on an old frame with cute clothes peg. It makes me think about a new original calendar. So i juste created one, printed, cut and did the same. Very simple to do and i love what it looks like! I first discovered digiscrap. It was through a forum of mums in 2005. There was a topic about digital scrapbooking in the hobby section. I saw beautiful pages and thought “wow ! how did they do that ?!! It’s amazing !” So I tried to make some pages by myself and it was a revelation for me. It was a new artistic way for formulating my emotions. I quickly liked clean and simple style, so elegant and soft. Then, some designers asked me to create albums with their kit. It was my first sales at stores. But i was more and more frustrated not to find the exact elements or papers I wanted to use for these albums. So, i started to create my own products.I currently follow a training in a school of applied arts to learn more and perfect myself in design world. Everything but above all, colours and images. Program: Adobe Photoshop CS6 and Adobe Illustrator. Add to the elements the missing colour that you don’t find in papers : that will do all the difference ! I really like my Queen of the day kit and these brightly colours ! Mother’s day inspires me. I saw a beautiful bunch of flowers with pink, yellow, coral colours; the marriage of these colours strikes me. All women have this special, unique day once in their life and we all have a mother, so everybody can use this kit ! Because it’s project life !! All about project life is popular right now. It’s a full pack of my project life essentials packs so colours are very differents, sweet and fun at the same time ! 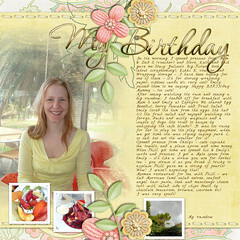 These journal cards are so easy to use, in an album or to create a page. BUT the plus of this pack : you can build your own journal cards as you wish, you can create new ones to enlarge the collection thanks to the papers, stickers and wordarts offered in separate files. That makes it special. 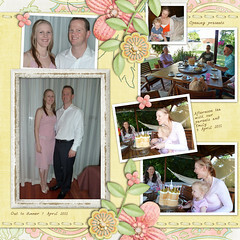 Here are some more inspirational layouts using Ange’s products. All of the layouts are linked to the originals with credits. Go have a look in Ange’s store! We will randomly select TWO winners to win $10 in product! All winners will be selected through the Rafflecopter widget below. There are several ways to enter and you can do ALL of them to gain more entries for yourself! Layout by SharonS. Supplies: Eternally by Ange Designs; Template by Our Misadventures; Font: Courier. Summer is not over and there is still time to plan your next road trip! Our family is gearing up for a crazy 40-day trip to over 20 states. We are filled with equal amounts of excited anticipation and total fear. Seriously? Six kids. One pop-up. 40 Days. I am pretty sure we are crazy. But crazy is good and I can’t wait to show my kids around this beautiful country of ours! One of the sites I have been spending a lot of time on lately is Roadtrippers. It’s a fun site I discovered via Pinterest and it has been great in helping me find things to see and do along the way, especially in areas I am not familiar with. On the main page, you type in your start and end locations. In this example, I am using Colorado Springs as my starting point and Northwest Arkansas as my ending point. This is a two-three day leg of our trip that we have nothing planned for. I wanted to see if there were things to do along the way. Once I plugged in my info, a map of my route showed up. In the upper left part of the screen, there is a menu box where you can input what you would like the site to find for you. You can choose a number of options including food, attractions, nature, and shopping. You can also choose how many miles off your course you are willing to go. I chose nature since that is what we are most interested in. It then gave me options for what kinds of nature I was interested in. I chose “view all” and then it plotted points along my way. On the bottom of the screen, thumbnail images of the various points pop up and I can click on each of them to learn more about them. The site seems to be entirely user-built. This means that the information on the site is from other site users. As people add information, more is available. I love the community approach to finding the best places to visit! If you look at the individual screens, you realize you can do a few things. In addition to planning that is specific to your trip, the site also has fun guides to help you explore more. I haven’t had a lot of time to learn the ins and outs of this site, but I think that it is a great resource for trip planning and also for memory keeping. I love doing things like saving screen shots of maps so we can see exactly where we are going and where we have been. An added bonus? We’re doing a shorter camping trip this weekend and I found a place to see along the way. How cool is this? Now obviously, I am all for helping our kids have fun, but I am not of the opinion that kids need to be occupied at all moments of every day. By letting them be bored, they learn to create their own fun. Today’s post in a case-in-point. We’ve been busy this summer. I am doing some extra photography and writing work, I am taking a graduate class, and we are getting ready for our 40 day road trip. This has meant that we haven’t been able to do as much out-and-about activities and the kids have been left to play outside and when it’s too hot, to find things to do inside. They don’t often complain and I love to see the things they do to entertain themselves. Yesterday I was handed an invitation to attend an art show and auction. The invite stated that it would be today at 11:30 in the living room of the house where we are staying. Dutifully I pushed save on my class work and walked downstairs precisely at 11:30. The kids had been working for the past week on different art projects. I keep craft supplies available at all times and I say “yes” to odd requests like, “Can I have all the empty pizza boxes?” But other than that, I did nothing in way of coming up with their projects. When we arrived downstairs, the art projects were laid out for people to see. Then we took our seats and each project was presented by the artist and was described by the emcee. Then we were given our auction number and a pile of money. Then the fun began. The kids were the auctioneers and they auctioned off their many pieces, while the audience (me, my husband, my aunt and uncle, and Bethany) waved our numbers high as we tried to outbid each other. I think the idea of an art auction is something that almost any family could pull off. Just have the kids create a certain number of pieces and then plan the date and time for your art show and auction. You can make it as casual or as fancy as you would like. I’d love to do it again, complete with party dresses and hors d’oeuvres. Want to know what fetched the highest bid? The collaborative PIG FARM project (the reason behind the pizza box request.) It sold for over $3000! Here are some of the fun goodies we found from around digiland this week! Date Night…Girls Night Out…or just a cozy night at home for Family Movie Night, Chelle’s got you covered with Movie Night. coming soon to my other stores. Crossbone Cuts has a new mini kit for week 3 of the Scrap Orchard Iron Scrapper Competition! Shake Your Tail Feathers by Erica Zane & Libby Pritchett will have you strutting your pages in style! With it’s gorgeous jewel tones and fun elements, it’s perfect for all sorts of occasions! It’s hip to be square ~ square frames and photos that is! Fuss Free: Hip To Be Square 3 & 4 are designed around square and rectangle framed photos, and then gorgeously surrounded by a variety of elements to create a classic look! Fresh Fruit priced at 20% off ~ buy Set 3 and get Set 4 FREE! Offer ends July 24th. Do you Jenn Labre is celebrating her grand opening at Pickleberry Pop with a HUGE sale! Kristin Aagard has a new mini kit Honey Bee in the Iron Scrapper this week at Scrap Orchard. Meagan has a fun kit out, Steampunk is retro vintage fun! In a great palette, with awesome worn and grunge elements, this kit is great for trains, mechanics or vintage scenes! Playful and yet sophisticated, get Steampunk packs for 30% off through July 20th or save 40% when you purchase the bundle! Available at both Gotta Pixel and The Digichick. her shop! Check out her blog for more details. Celebrate summer with a huge sale @ Studio Wendy! Save 30% for a limited time, and no coupon is necessary! Layout by Vicki. Supplies: Say Something Bundle by Dunia Designs; Fonts: The Things We Said, Calibri. Layout by Melissa. Supplies: Say Something Bundle by Dunia Designs; High Noon (template) by Heather Joyce; Fonts: The Silver Reed by Heather Joyce. Layout by Lauren. Supplies: Say Something Bundle by Dunia Designs; Fonts: CK Ali’s Hand and Typewriter. Layout by Jacki. Supplies: Say Something Bundle by Dunia Designs; Building Blocks 2-3 (template) by Janet Phillips. Layout by Rachael. Supplies: Say Something Bundle by Dunia Designs; Fonts: Pea Sadie and Traveling Typewriter. My name is Dúnia, I’m a 37 old brazilian girl. I live with my DH, my 3 kids, a 10 years old boy Yuri, my twins girls Eduarda and Rafaela aka little tsunamis and my two dogs Floquinho and Pantufa. I work as a designer and photographer (this is new for me). And I’m addicted to books, tv series, soccer and Project Life. But the thing I love the most is spending time with my family. 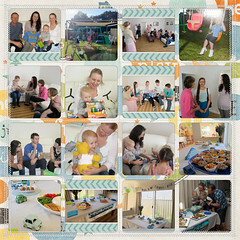 Since I discover Project Life back in 2012 I’m totally addicted to it, I love make the spreads, is so easy and fast, and I love to rint my picks in weekly basis, so I can see the album coming together with my kids. I start as a scrapper about 6 years ago and a year later Loreta Labarca invites me to create for the first Brazil digital scrapbooking store, and after that I never stopped. I was very inspired by my kids, they world, clothes, books, toys, everything in they world are so colorful and full of life, I always try to use that in my designs. Computer: I work in a PC Computer. When I have a hard time choosing a color scheme I alaways look to my kids stuff, many of my products have the colors from their cloths or books. I love to make (and use) Valentine’s Theme Products, and I really like my latest one, the colors mixed with kraft, the papers, elements but spcially the journal cards. 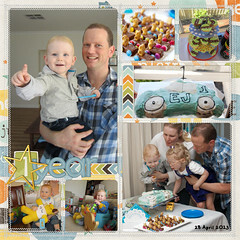 I think my most popular products are from the Documenting Everyday Collection, like this one A Year of Memories. Today so many people are doing pocket pages so I think this is why they are so popular. Here are some more inspirational layouts using Dunia’s products. All of the layouts are linked to the originals with credits. Dunia’s store with coupon code dunia_TDD30 (expires July 31). Go have a look in Dunia’s store! We will randomly select TWO winners to win $10 in product! All winners will be selected through the Rafflecopter widget below. There are several ways to enter and you can do ALL of them to gain more entries for yourself!